Yogurt has become so synonymous with our daily lives. But who would ever think of making it at home, right? Well, for those who may think this, you’re at the right place because this recipe is exactly for you. Right now, yogurt is having a moment. It’s in every commercial, you can buy it in almost every flavor, and it’s made with every kind of milk possible (or no milk at all). For me, when an item becomes so easy to buy, it also becomes easy to forget about the overall cost of buying it. I throw a few yogurt containers into my shopping cart each trip and pretty soon, it’s hundreds of dollars for the year. I also tend to forget to look at each yogurt brand’s ingredients to see exactly what’s going into it. But not with yogurt you make yourself! 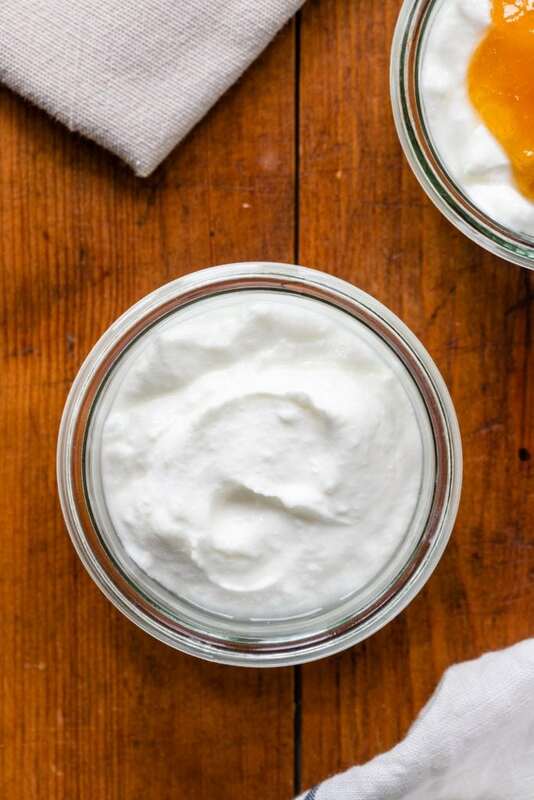 Homemade yogurt is simple to make: just three ingredients and a bit of time. First, we need to understand what yogurt actually is. In its most basic form, yogurt is a combination of two things: milk and live active cultures. It may be obvious, but the main ingredient is milk. 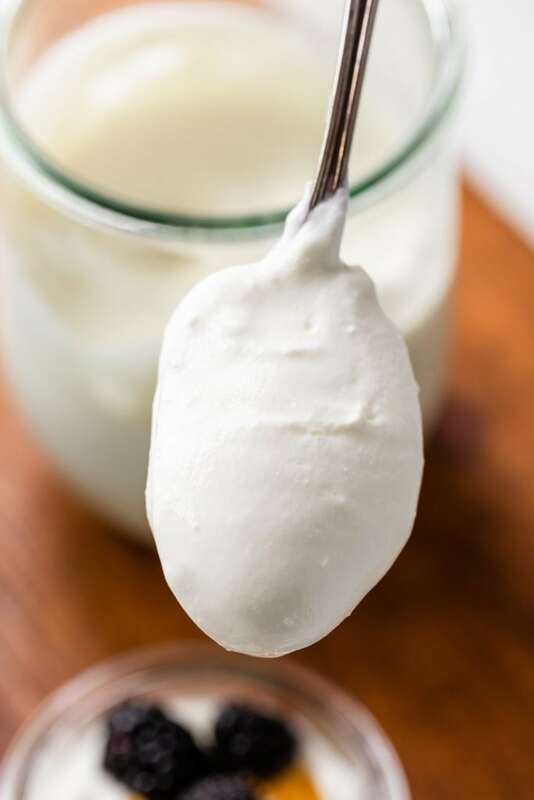 Since there are multiple types of milk on the market, here’s one thing to remember: the percentage of fat in the milk determines the type of yogurt you’ll make. Whole milk will create whole milk yogurt and skim milk will create skim yogurt. I know, pretty elementary, but I thought it was worth stating just in case. High-quality milk is important because it determines how the yogurt will taste. Make sure to buy organic milk. Yes, it’s more expensive but aren’t our bodies worth it? 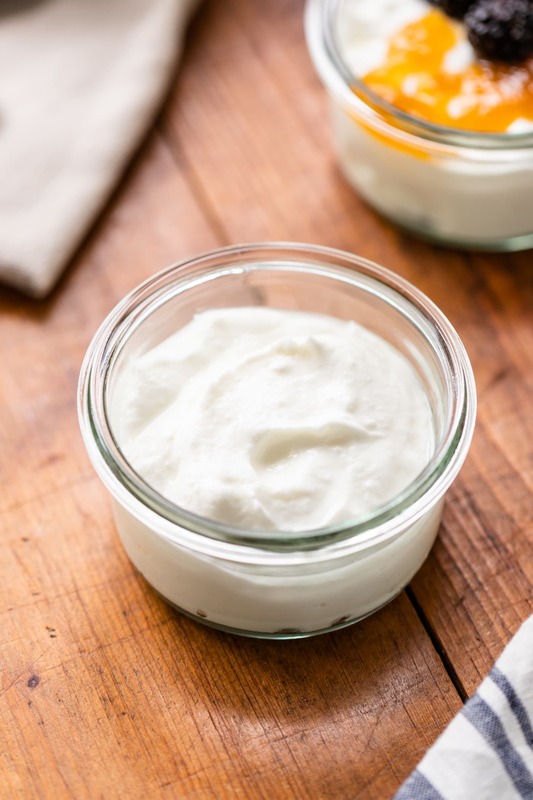 To make yogurt, you need active cultures. These bacteria are what work during the heating process to ultimately create the yogurt. 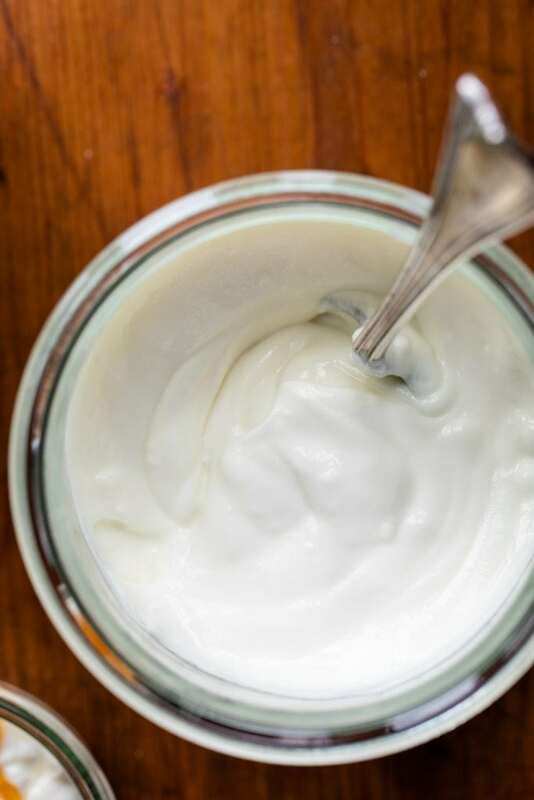 You can buy dry, active cultures in powdered form in many health food stores, or purchase your favorite good-quality yogurt and use that as the culture. Start by heating the milk to 180-185 degrees Fahrenheit. Getting to this exact temperature is very important for achieving that creamy yogurt texture, so a good thermometer is essential. It’s a whole science thing that I can’t say I really delve into too much but is definitely needed. Then the milk needs to cool down. If the active cultures are added when the milk is hot, the bacteria will be killed and no yogurt will form. That would be a sad day! Once cooled down, the cultures are added. At this point, I like to add dry milk powder. Milk powder makes the final yogurt thicker and smooth, just like I like it. After it’s all stirred together, you just keep it warm (I use my oven) and let the bacteria do their thing. The time the yogurt sits creates the flavor it will have, so let it sit from 4 to 8 hours. The longer the time, the tangier the yogurt will be. 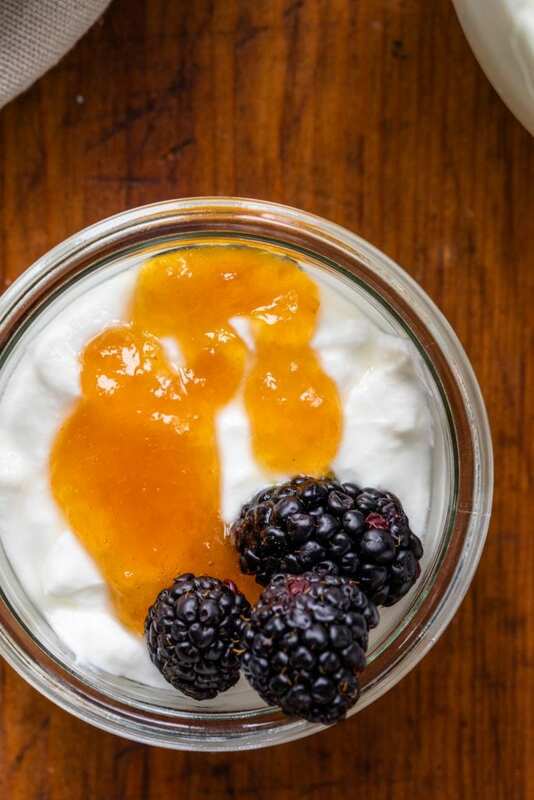 If you haven’t made homemade yogurt before, start with 5 hours so the flavor doesn’t overwhelm you. Then you can adjust further batches to your liking. The big buzz words in the yogurt world are 1) Greek and 2) regular. What you may find surprising is that there’s really no difference between these two other than how long they’re strained. Simple, right? After the yogurt has fermented, it’s strained in a cheesecloth. The longer you strain the yogurt, the thicker it will become, just like the Greek yogurt we buy. If you strain it for a shorter amount of time, the yogurt will be on the thinner side, like regular yogurt. 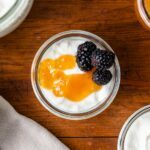 How long does homemade yogurt last? Once made, the yogurt will last at least two weeks in the refrigerator. Make sure to store it in an airtight container for maximum shelf life. How else can I use yogurt? Bonus! I’ll often substitute yogurt for any recipe that calls for sour cream. Now that’s what I call versatile!